My son is big into making crafts these days!! He just loves to make something so that when Daddy gets home he can show it off!! Plus, he loves to make crafts to put in his sisters room as well!!! If we are not heading out to the library for story time/crafts, or to playgroup, or to the mall for crafts, or out for the day, I always make sure I have a craft printed for that day. He knows now, if we have a home day...it's craft day as well!! Preschool Paper Crafts -say in the Paper Craft section for the free printable crafts, OR browse around and see what craft ideas you can get! 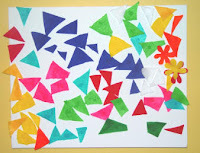 Preschool Activities and Crafts- The have a great selection and lots of variations too!! Crafts for Preschoolers and Kindergarten -cute little simple projects!! Preschool Crafts- Great crafts to make using things from home!! Fun Toddler Activities- Lots of fun toddler Activities to make!! That should keep your crafty toddler busy for a little while at least!!! Have a great site you use to get kiddie craft ideas?? I can always use more craft ideas for my little guy! !